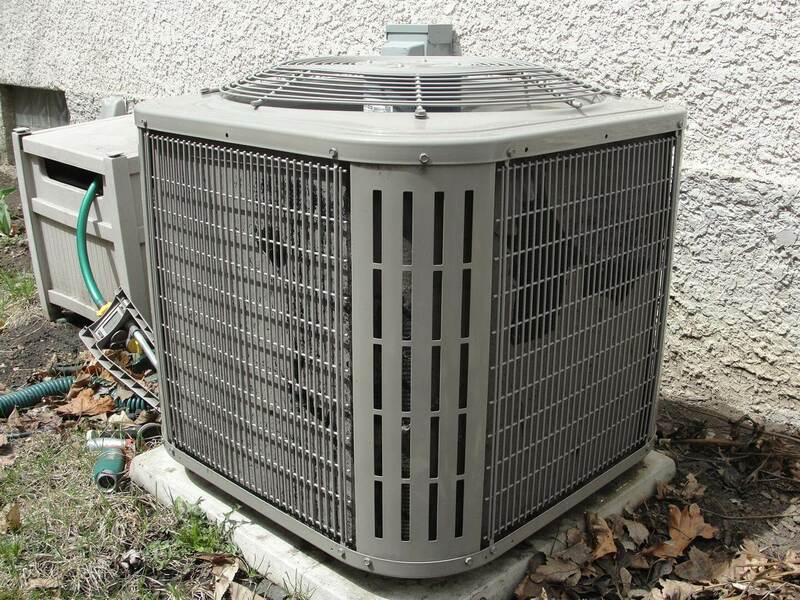 Before turning on your air conditioner for the first time this year, there are three basic maintenance items to check on; the condensate line, the air filter, and the condensing coil. According to Mark Jerde of RightMark, these three items make up a large portion of easily preventable equipment failures. In Minnesota, about 99.2% of single family homes with AC have a split system. 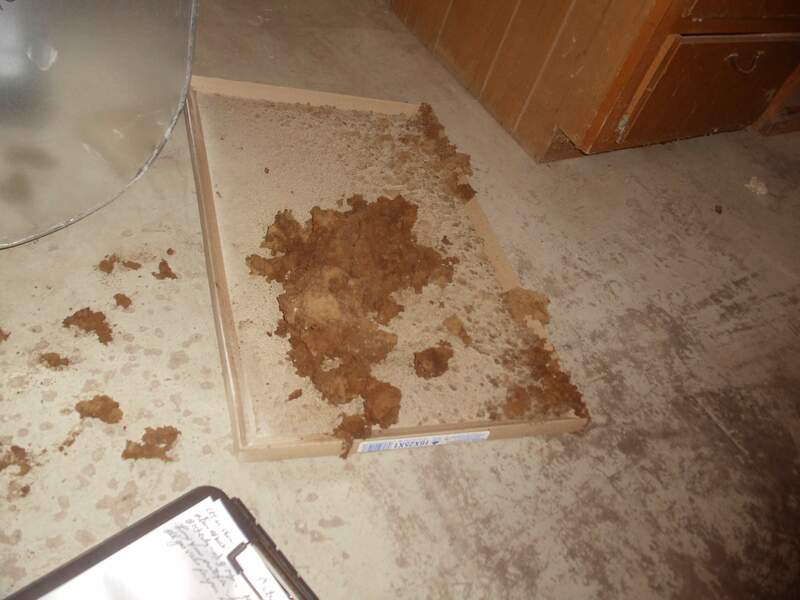 This consists of a big box that sits on top of the furnace called an evaporator coil, which is connected to another box at the exterior that contains the compressor and condensing coil. If you're curious about how this system works, head on over to HowStuffWorks; they have some nice descriptions and illustrations. An air conditioner 'conditions' the air by removing heat and moisture. As warm, moist air gets passed over the evaporator coil (the thing that sits above the furnace or air handler), moisture condenses on the cold tubing. This condensate drains down to a pan where it gets directed out. Condensate needs to be directed to an appropriate location, which is typically a nearby floor drain. The drain material must consist of cast iron, galvanized steel, copper, PEX, polybutylene, polyethylene, ABS, CPVC, or PVC pipe or tubing. The drain must also have an internal diameter of at least 3/4". 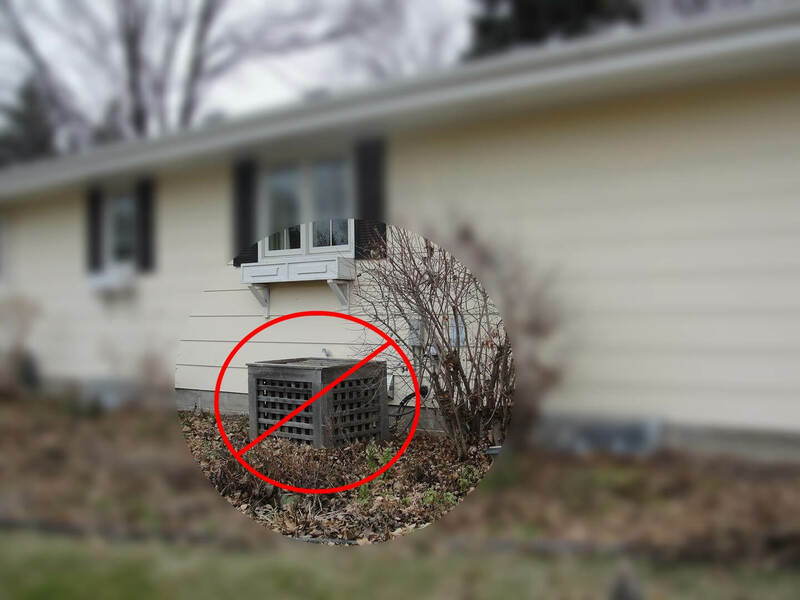 When improper materials are used, the drain is undersized, or when the drain needs to wrap all over the basement to get to a floor drain, the condensate drain has an increased potential to get blocked up. 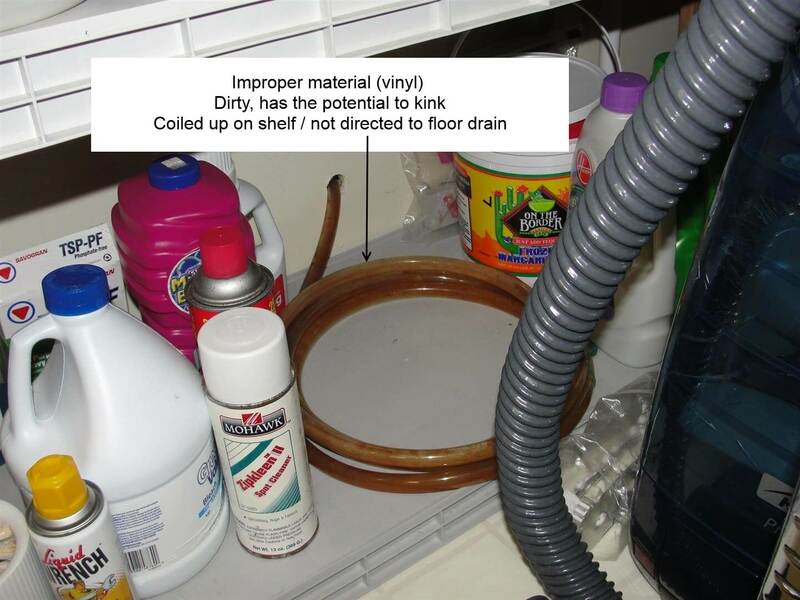 If the condensate drain consists of a garden hose or clear plastic tubing, replace it. This will help to prevent a blocked condensate drain, which will help prevent unwanted leakage at the evaporator coil. Before running your air conditioner for the first time during the summer, make sure the condensate drain is directed to an appropriate location. When the AC condensate drain needs to run across the floor of a room, people often coil the drain up so it's not in the way when the AC isn't being used. 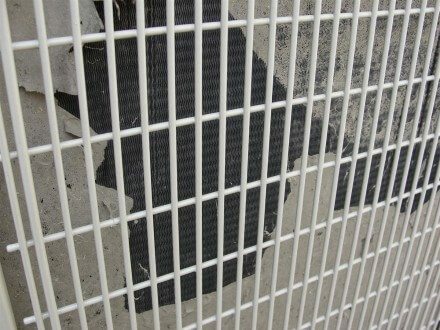 The air filter, also known as the furnace filter, needs to be replaced regularly. Usually every one to three months will do, depending on the type of filter that's installed. While most homeowners know about changing the filter during the winter, this still needs to happen during the summer when the AC is running. 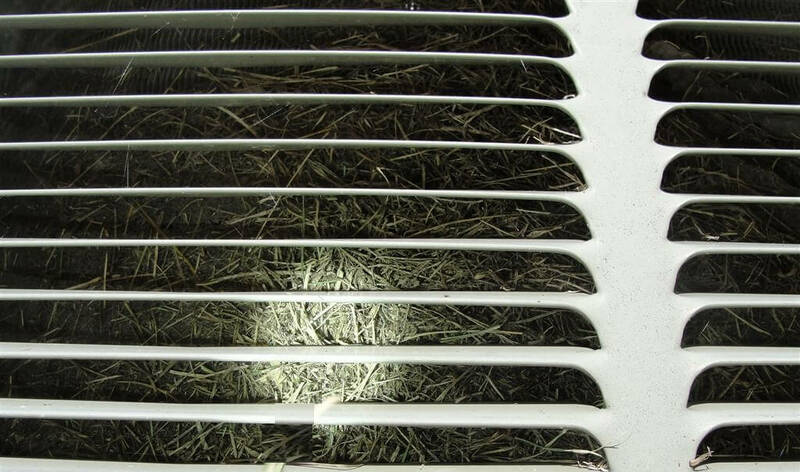 If the home has a high-velocity system with an air handler in the attic, the filter will usually be located at the ceiling in an upper level hallway. Restricted air flow = reduced efficiency. This is the one that gets forgotten about the most. The compressor and condensing coil are the parts that sit outside the home, preferably in some out-of-the-way part of the yard. To help dissipate the heat that gets removed from the home, a big fan pulls outdoor air over the condensing coils. For the condensing coil to work properly, it needs plenty of air flow. This means no trellis attached to it, no ivy, no plants, no walls, no boxes, and so on. Clearance requirements will vary from manufacturer to manufacturer, but a good rule of thumb is 24" of clear space. Keep vegetation trimmed away. Condensing coils also need to be cleaned regularly. 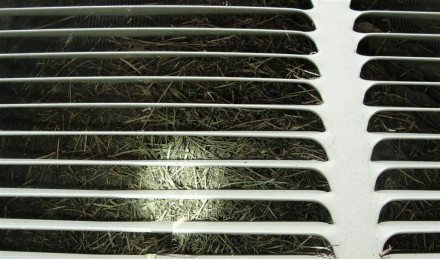 When they're covered with dirt, dust, grass clippings, dryer lint, cottonwood seeds and other outdoor stuff, air flow can be severely hampered. Take the time to inspect all sides of the unit and clean the coils off if necessary. This can usually be done by spraying the unit down with a garden hose. Don't try a pressure washer; the fins will bend very easily. If the unit has protective grills that prevent access to the coils, the grills will need to be removed first. At that point, a little bit of dismantling is involved, and some homeowners might prefer to contact an HVAC tech to do the work.